This is a seriously exotic piece of kit. For those of you unfamiliar with Bimota: they’re a boutique manufacturer of very exotic motorcycles. Founded in 1966 [to manufacture heating systems, not bikes], the name comes from the first couple letters of the founders’ names: Bianchi, Morri, Tamburini. Yes, that Tamburini, of Ducati 916 and MV Agusta F4 fame. And that Bianchi, if you’re into bicycles. 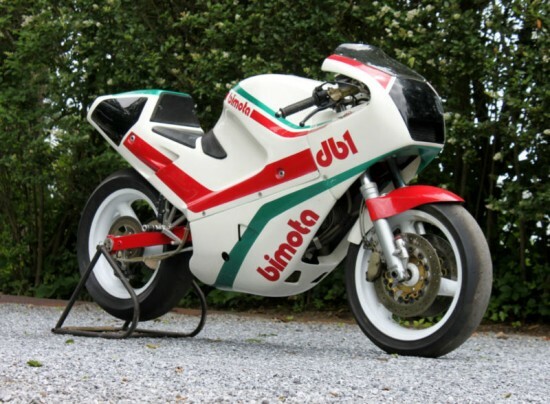 Bimota got their start making motorcycles in the 1970’s, taking the powerful and reliable engines from evil-handling, flexible Japanese bikes then stuffing them into light, rigid frames and wrapping them in wild, modern bodywork. 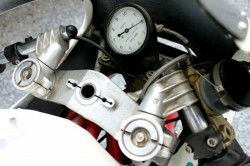 The DB1 was the first bike produced by Bimota to be powered by the V-Twin Ducati motor. Ducati has rarely had a problem with handling, but the Bimota name made an already rare and exotic name even more so, and the partnership has been a success for the small firm, spawning “DB” bikes up through the DB8 and the Tesi series of hub-centered bikes. 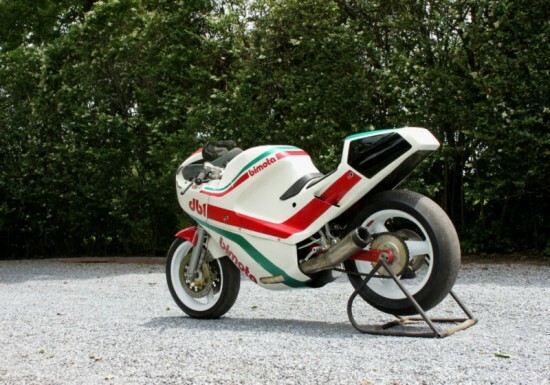 In 1986 Bimota sent (4) DB1R – Factory Race Bikes to the United States. Davide Tardozzi, Malcolm Tunstall and Dale Quarterley each campaigned a DB1R (The 4th is known to have purchased by a privateer and destroyed by fire during an on-track accident). 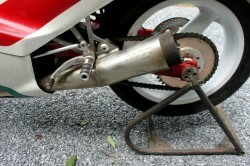 This is Dale Quarterley’s bike and from the exterior can be noted by the custom Supertrapp exhaust made to lower the foot pegs for his 6′ – 4″ height. 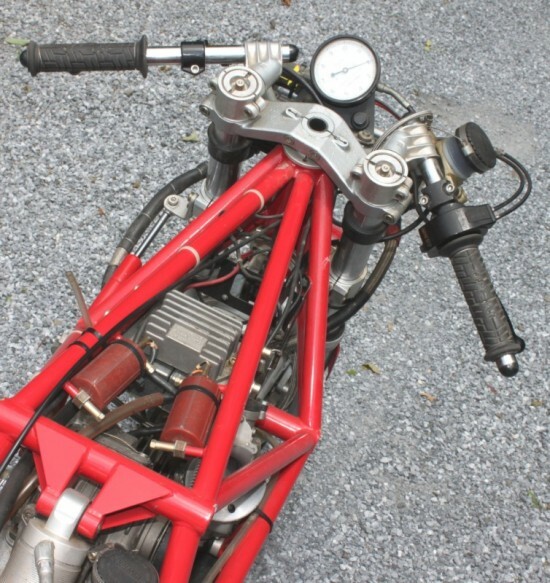 Built and supported by Ferracci in Pennsylvania throughout the 1986 season, the motor was developed with many tricks including increased displacement and compression. 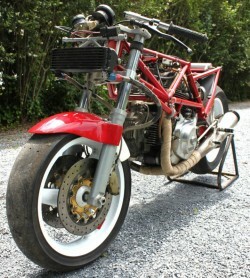 Delivered with Ducati’s 750cc Montjuich motor, already it was a hot and powerful motor. 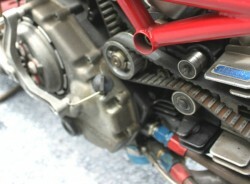 This bike also has magnesium Bimota labeled mechanical clutch, valve covers, and Bimota stamped wheels. The bodywork is all fiberglass and the gas tank is in the removable upper body panel and of course never had ethanol within in it. 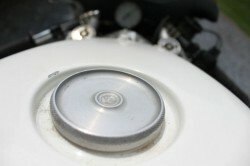 If you look, you can even see a little “Fast by Ferracci” badge on the close up of the engine by the cam belts. A general guide to decoding the alpha-numeric Bimota naming system: the first letter indicates the engine manufacturer, the second is “B” for “Bimota”, and the number indicates how many bikes they’ve built using that manufacturer’s powerplant. So a SB8 is the eighth Bimota to be powered by a Suzuki motor, and YB11 is the 11th Bimota to be powered by a Yamaha engine, and so on. This bike has been up for sale recently, back in July. It looks like it found no takers then, and at the current Buy It Now price, may not find any this time either. Hopefully it will find a new home this time around.